Sergej Mihailovič Èjzenštejn’s collaborations with Prokof’ev, along with his essays from the same period, illuminate the director’s reconceptualization of his editing practices in relation to the possibilities offered by synchronized sound. Throughout his career, Èjzenštejn sought to understand rhythm and tempo in their psychological dimension: How fast do things seem to be going? What formal parameters or systems affect our sense of rhythm and of pace? These questions continued to inform his sound films, and shaped his work with Prokof’ev in fundamental ways. 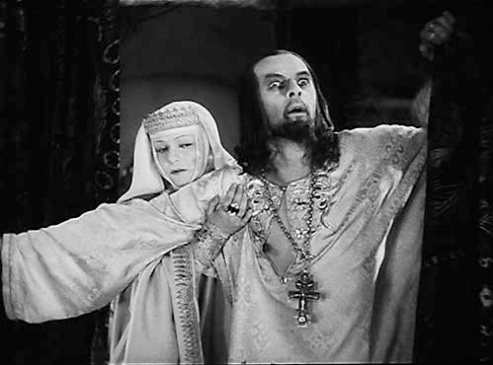 This according to “A lesson with Eisenstein: Rhythm and pacing in Ivan the Terrible, part I” by Lea Jacobs (Music and the moving image V/1 [spring 2012] pp. 24–46). This journal, along with many others, is covered in our new RILM Abstracts of Music Literature with Full Text collection. Today is Èjzenštejn’s 120th birthday! Above and below, his Ivan Groznyj I, the film discussed in the article.